This post includes Amazon affiliate links. If you click on a link and make a purchase, I will receive a small commission from the sale. Thanks for supporting the A Journey to Thin blog! How many of you have a continuous battle in your mind about your food choices. For myself, it’s a struggle that never really stops. I struggle with guilt about my food choices and with an all-or-nothing mentality. My struggle with my weight and food is constantly on my mind. Judy Payne contacted me at just the right time. She sent me her book titled Judy’s DietGlue in exchange for a review. This book is filled with helpful advice from a woman who knows what it’s like to struggle with her food choices but has kept over 100 pounds off for over 30 years. Judy knows what she’s talking about! She does not recommend a particular diet plan or weight loss method, but simply recommends following a “sensible weight-control plan”. 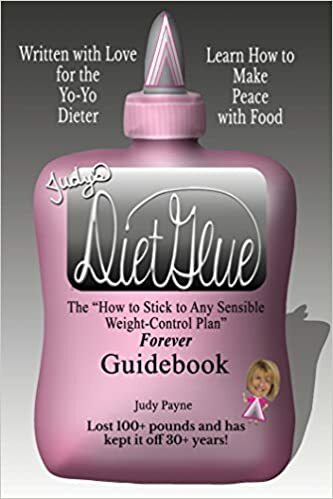 Judy’s DietGlue is a guidebook on how to stick to that plan. Getting healthy has so much more to it than just eating less and exercising more and Judy knows this first hand after many failed diet attempts. The conclusion that she came to was that long-term weight control requires first getting your head, heart, and hectic life organized so that you can stick to your plan—that and getting any compulsive eating under control. She says it best when she writes, “well intentioned zealots and money-hungry missionaries of mindless diet dogma try to feed us simplistic, absolute, black-and-white answers for our mulitfacted, tangled, multishaded gray problems”. The truth is that weight loss is not black-and-white and the same for every individual. It’s always a gray area that each and every one of us has to figure out for ourselves through experimentation. We’re all unique. There are a few concepts in Judy’s DietGlue that have truly stuck with me. One concept is that we have two selves, the logical and realistic part of ourselves and the fun-loving part of ourselves. For example, when we make food choices the logical voice would say, “this cake is too many calories”, while the fun-loving part of us would say “But we’re celebrating a birthday!”. We need to have a balance between both selves. Sometimes it’s ok to be the fun-loving, indulgent self but just as equally (if not more so) we still need to be logical, realistic, and make conscious decisions keeping the future in mind. Being mindful of these two selves and the thought processes has helped me. The second concept is that while there may be something that happened to us or contributed to our weight-gain, we don’t necessarily need to focus on finding out what that was. We don’t have to know why. All that we really need to do is put our focus on moving forward and meeting our goals. I really love that. Judy has an engaging writing style making the book entertaining to read—she’s a funny lady! She self-admittedly does have some corny jokes though. While reading the book, I felt like I could have written it myself! Truly, Judy “gets it”—she knows what it’s like to be the over-weight woman and understands all of the mental complexities that go along with that and has useful advice for those of us who struggle. I recommend Judy’s DietGlue because of the common-sense, practical advice she gives for long-term weight management. Plus, the information is tried and true because her life proves it! The book is available for purchase on Amazon in both hardcopy and e-book formats. You can also visit her website at judypayne.com/dietgluebook. Judy has graciously sent an extra copy of the book to giveaway to one of you! I’m also adding a $10 Amazon.com giftcard to the prize pack. You can enter via Rafflecopter below to win. U.S. only please.